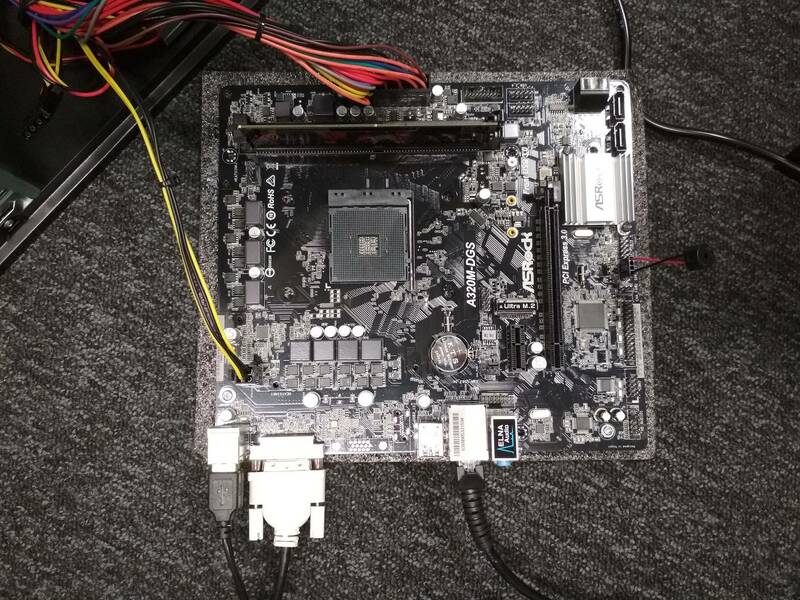 I have bought an ASRock A320-DGS motherboard and a Ryzen 5 2600 CPU. After assembling all of the components together, when I tried to boot the machine it would not boot (PSU turns on and so does the CPU fan, no image on the motherboard DVI connected screen). I tried removing it of the tower, trying to boot the motherboard from outside the box to try and rule out any short-circuit related problems. I have tried removing HDD, memory and CPU to try and find out the cause of this. When I try to start the machine, I get a two round 5 beeps from the motherboard. I read online that I might need to update the ASRock firmware to get it to boot the Ryzen 5 CPU. So I tried removing the CPU and tried to boot the motherboard hoping to get to the BIOS screen and see if I can update it. However, still no image. I am not sure if I need to do something to get this to boot to the BIOS without CPU, if this is even possible, or what should I try in order to tray and trace the cause of this. Browse other questions tagged boot cpu motherboard bios or ask your own question. MSI H310M Arctic Gaming and i5-9600k not booting?